When it comes to Walt Disney World, there are rare occasions when a box is just a box and a name is just a name. There are not many such moments, but they do happen. In the case of sculptures, however, it seems as if there is always a story being told. 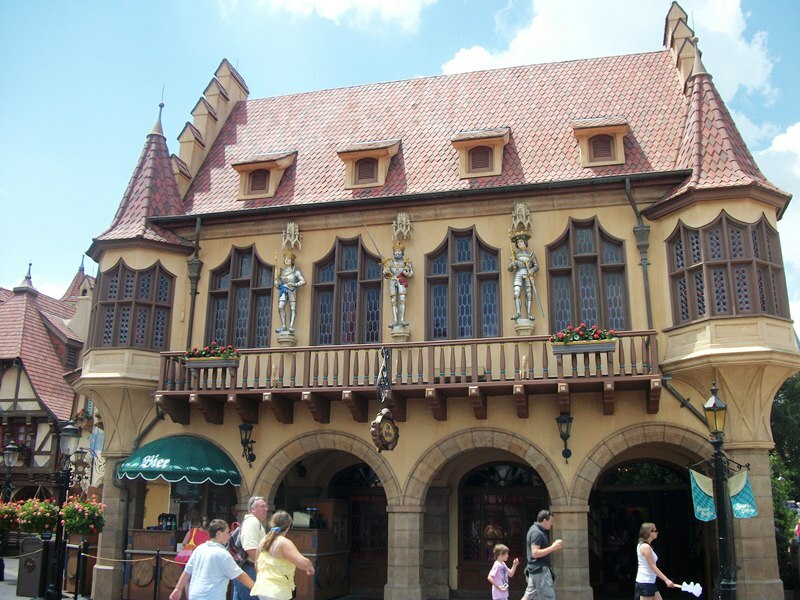 Such is the case of the three kings who watch over the square in World Showcase’s Germany. Based upon the Kaufhaus, located in Freiburg, Germany and built in 1520 - 1521, Gild Hall serves as the home to Das Bucherwurm. While even the minutest of details were recreated throughout the pavilion and on the figures, there have been modifications from the original merchant’s hall. For instance, the color scheme has been changed to conform to the palate of the pavilion, and the second story sculptures of Kaufhaus appear to have suffered the loss of one of its emperors in the transition to Gild Hall. The original versions of the statues were crafted over an eleven year period, from 1520 to 1531, by Hans Sixt von Staufen during the reign of the Hapsburgs. Kaufhaus features four of the most recent rulers, in 1520 that is, Maximilian I, Philip I, Charles V and Ferdinand I. In order to accommodate the resizing of the building, and to keep proper perspectives intact, Maximilian I was the emperor chosen to be left off of the finished Gild Hall. 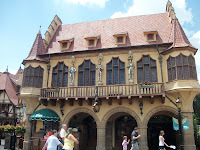 World Showcase is a wealth of not only architecture and food, but also art, history and culture. You just have to know where to look, which is up, down and all around, or know who’s looking at you!